Estate of the artist (1944-1958). Sidney Janis Gallery, New York (1958-1962). Acquired from the above by the late owner in 1962. C. von Wiegand, "The Meaning of Mondrian," Journal of Aesthetics and Art Criticism 2, no. 8, fall 1943, p. 64. M. Seuphor, Piet Mondrian, Life and Work, New York, 1956, p. 416, no. 164 (illustrated, p. 368, no. 130). A. Mongan, "Mondrian's Flowers," Miscellanea I.Q. van Regteren Altena, Amsterdam, 1969, p. 229 (illustrated, p. 396, fig. 4). M.G. Ottolenghi, L'opera completa di Mondrian, Milan, 1974, p. 96, no. 156. D. Shapiro, Mondrian: Flowers, New York, 1991, p. 56 (illustrated in color). J. Joosten, Piet Mondrian: Catalogue Raisonn of the Work of 1911-1944, New York, 1998, vol. II, p. 477, no. C47 (illustrated). New York, Sidney Janis Gallery, New Acquisitions, October-November 1959, no. 30. New York, Sidney Janis Gallery, XXth Century Artists, October-November 1960, no. 45 (illustrated). New York, Sidney Janis Gallery, Paintings by Mondrian: Early & Late Work in Progress, January-February 1962, no. 7. Dallas, Museum for Contemporary Arts, Dallas Collects 20th Century Art, August-September 1962. New York, Sidney Janis Gallery, Paintings, Drawings and Watercolors by Piet Mondrian, November 1963, no. 13 (illustrated). New York, Marlborough-Gerson Gallery, Important European Paintings from Texas Private Collections, November-December 1964, no. 29 (illustrated). Santa Barbara, Museum of Art; Dallas, Museum of Fine Arts, and Washington, D.C., Gallery of Modern Art, Piet Mondrian, January-June 1965, no. 22 (illustrated). Dallas, Museum of Fine Arts, Dallas Collects: Impressionist and Early Modern Masters, January-February 1978, no. 66 (illustrated). Dallas, Museum of Fine Arts, Impressionist and Modern Masters in Dallas: Monet to Mondrian, September-October 1989, no. 57. New York, Sidney Janis Gallery, and Fort Worth, Modern Museum, Mondrian Flowers in American Collections, March-July 1991, no. 6. 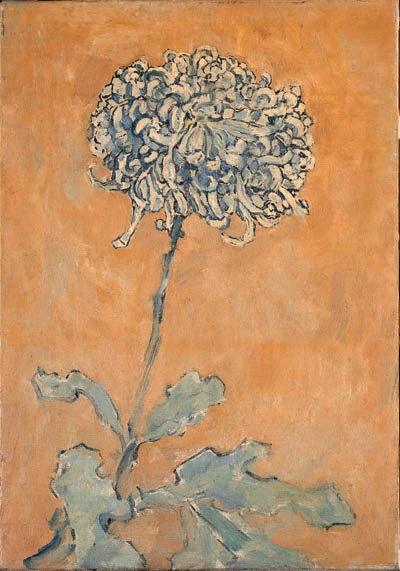 Throughout his whole career, even while he was devoted to abstraction, Mondrian continued to paint flower pieces. As a result, the dating of these works is very difficult. Seuphor dated the present work to circa 1906 (op. cit., pp. 368 and 416), while Ottolenghi dated the painting to 1907 (op. cit., p. 96). However Joosten has included the work in his Catalogue Raisonn of the Work of 1911-1944, with no precise date, but with the comment that "It is not at all impossible that the authors of this Catalogue Raisonn have incorrectly dated a number of these flower pieces as 'late'. They would be glad to pass the honor of dating them more precisely to those who come after them." According to A.P. van den Briel the flowers are a category by themselves, a closed privileged group, "Sometimes by fits and starts, he wanted to paint them just like that. This has a much deeper meaning. A memory of something vastly beautiful he had experienced, and something sad. He did remark once or twice that it hurt him to do those flowers. They reflect much of Mondrian's inner life as an individual and as a painter." (letter from A.P. van den Briel to J.M. Harthoon, quoted in J.M. Harthoon, Mondrian's Creative Realism, Mijdrecht, 1981, p.15). The present work is an extremely rare example, since Joosten lists over 110 flower pieces by Mondrian, only six of which are recorded as being executed in oil. Three of these oils are to be found in museums, as follows: Haags Gemeentemuseum, Minneapolis Institute of Arts, and Cleveland Museum of Art.